There are a variety of diseases that affect the spleen and can cause destruction of blood cells, platelets or red cells. ITP, or immune thrombocytopenic purpera, is a disease which destroys platelets and can lead to bleeding problems. If not controlled by medication, splenectomy is highly effective at curing this disease. Hereditary spherocytosis which could cause severe anemia, also responds well to splenectomy. A variety of other disorders of the spleen can respond or require splenectomy. Laparoscopy is ideally suited to this operation especially if the spleen is of normal or reduced size although even enlarged spleens can be removed this way. The recovery is quicker and easier than with open surgery. The laparoscopic splenectomy is suitable for many patients. After the patient has been anesthetisized, a laparoscope is inserted into one of four incisions in the abdomen. The abdominal cavity is filled with carbon dioxide. Using tiny surgical instruments inserted through thin trocar tubes the ligaments holding the spleen in place are separated and then the main blood vessels are sealed. The spleen can then be detached and placed in a bag, where it is broken into small pieces that allow the bag to be removed through one of the small incisions. One or two days of hospitalization will probably be required for a laparoscopic splenectomy, as opposed to about five days for open surgery. In some cases, particularly for patients whose spleens are excessively large (over 1000 gm), the doctor may elect for open surgery instead of the laparoscopic procedure. More recently, minimally invasive splenectomy can be performed using robotic technology. The da Vinci System is a robotic surgical platform designed to enable complex procedures of all types to be performed. There have been some major benefits experienced by surgeons using the da Vinci Robotic Surgical System over traditional laparoscopic approaches. These benefits are greater surgical precision, increased range of motion, improved dexterity, enhanced visualization and improved access. 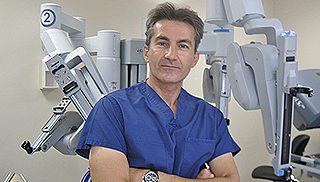 At NEWPORT LAPAROSCOPY, Dr. Iraniha performs robotic splenectomy. After a thorough evaluation, Dr. Iraniha will determine whether robotic splenectomy is appropriate for a particular patient’s situation.